Matter of Trust was the fiscal sponsor for the planning stages of Fred George’s Solar Peace Sculpture, which appeals to the global citizen as well as politicians around the world. In addition to the commentary on current wars, this piece represents symbolically a call to the world to embrace alternative energies. 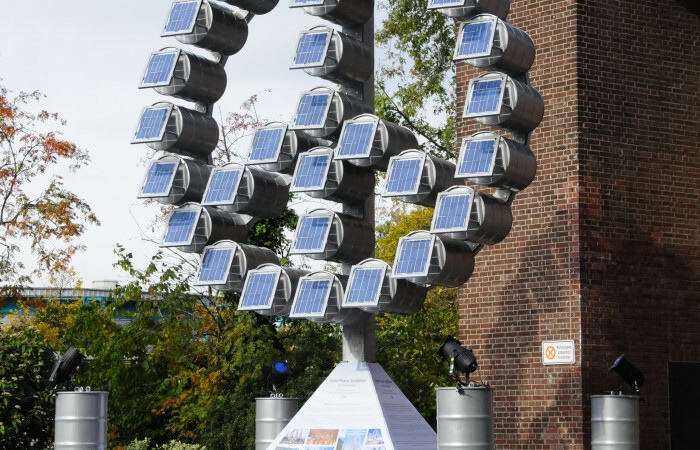 The Solar Peace Sculpture is constructed of oil barrels, with a solar energy panel mounted on each barrel. The solar energy produced from the panels will feed into the electrical grid of the city, with the monthly proceeds donated to various local charities. Recently, a six-meter-tall version was erected at the University of Saarland in Germany. George is now working on a fifteen-meter version and plans to turn the base into an interactive display. Proposed future sites include Battery Park and Madison Square Park in New York City, and Nanjing Lu in Shanghai. Fred George started his career more than three decades ago in architecture, fashion, music, corporate and advertising photography. Having been called “The American Helmut Newton,” these days George donates a lot of his time to create works of art in multiple mediums, including sculpture, which earned him a comparison with the artistic legend, Joseph Beuys. For George, his sculptures are a perfect way to express his global political and environmental concerns.